KILLER SWELL was published in 2005, which sorta feels like a lifetime ago. 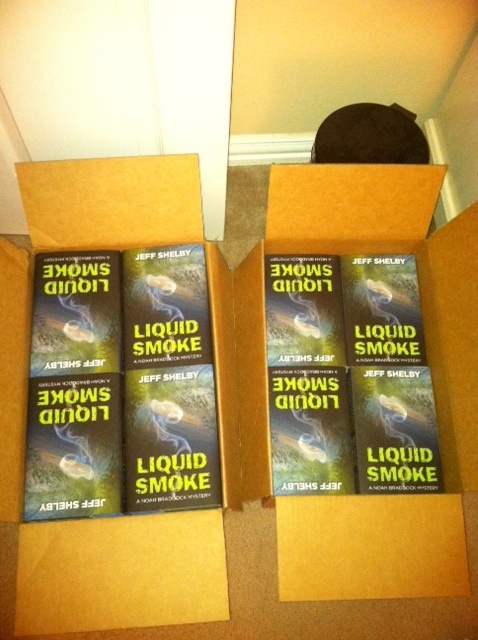 But I can remember when I got my author copies – the UPS guy dropped them off and I literally sat down on the tile in the entryway, opened the box and looked through the books. It was like Christmas. But better. WICKED BREAK was published 2006. I took the box into the living room this time before I opened it. My daughter had just turned three and she helped me open it. She was more interested in the box. Well, yesterday, guess what showed up at my door? I opened them in the living room. Then I just sat down with them for a minute, looking at the covers and paging thru them, not really looking for anything. And I think this time was the best because the wait was so long and because I like this book so much. Plus, they are so pretty! I’ll be giving a few of these away in the next few weeks – stay tuned for info – but you can assure yourself of getting one by going here. Congrats, dude. Really happy for you. Cannot wait to read this. Hope you didn’t think you were ordering smoke flavoring.